Whatever the occasion, PixelPole makes it easy to turn your photos into really unique cards as never seen before! 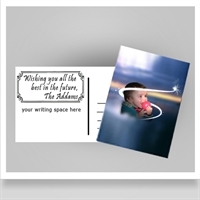 For more effects, please see our photo effects collection and chose "Cards and Postcards" as your printing option. This effect, "3D Message", comes printed in pack of 10 large (5.50x8.50) folded cards. This effect, "Picture in picture", comes printed in pack of 10 medium (4.25x5.5in) folded cards. This effect, "New Location", comes printed in pack of 25 large(5x7) postcards. This effect, "Magic Light", comes printed in pack of 25 medium(4x6) postcards.